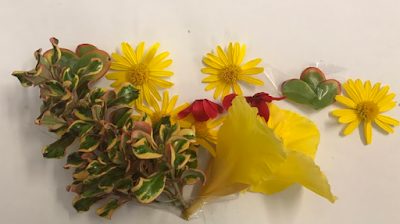 Hi yesterday I went outside to get some flowers for my flower collage and does are the flowers I found in our school gardens. The first flower I got was the little yellow daises, I got 5 of them then I got little red flowers from room 9's garden so as the big yellow flower. The little green leaves were from room 10's garden so as the big branch that looks like a tree but mini and that is how I got my flowers.